There are a lot of resources out there for getting a good night’s sleep. While they are helpful, frankly they can get a little boring. Where are the resources for those of us who maybe sometimes want a bad night’s sleep? I’ve created the very first resource on this topic, based on years of good-old-fashioned, tried-and-true experience. 1.) Eat sugary or spicy foods just before going to bed. While a sugar crash may help you nod off, you can rest assured (no pun intended) that you will be awake within just a few hours, and will fitfully toss and turn for the rest of the night (no pun intended), your heart pounding and mind racing. This will help you accomplish a lot that you may not have gotten to during the day, such as remembering all the things you should have done but didn’t, all the witty things you should have said during confrontative interactions but didn’t, and coming up with to-lists for all the ways you can be a more productive, successful, and all-around better person. If you’d rather stay asleep during your bad night, then spicy foods might be for you. One time, I ate crazy-hot buffalo wings before bed, I had really intense nightmares that I couldn’t get out of! I kept doing that fake-waking-up thing, you know, I’d be awake and think, “Phew,” then get out of bed and find myself right back in the same dream! I did that many times! This is a great way to ensure your brain stays compulsively active and creative while you remain asleep. 2.) Drink heavily just before going to bed. There are two options here as well: water and alcohol. Water will keep you up going to the bathroom all night, a nice “natural” way to get a bad night’s sleep. Alcohol—well we all know about that! You may technically get a lot of sleep after drinking alcohol, but don’t worry—when you wake up, you won’t feel rested at all, because drunk-sleeping is not actual rest! So between that and the dehydration, you know you will have gotten a very bad night’s sleep indeed. This seems contradictory. These chemical, medical products are marketed as aides for good sleep, when in fact, they are often aides for bad sleep. You will have to try a few different types, maybe even some cocktails, to find the right one for you. Whether it’s plaguing you with dreams you can’t wake up from (like a more powerful, synthetic version of spicy food), leaving you exhausted and groggy in the morning, or even continuing the exhaustion and grogginess for up to 48 hours, you can surely find the right product for you. 4.) Mix up your bedtime. This works best for creatures of habit. Some people can sleep where- and whenever, but for the rest of us (no pun intended), a simple switch-up of our schedule can really spoil our sleep! We all know how staying up late can mess us up, but the reverse can be equally effective. There’s nothing quite like going to bed while it’s still light after a short, tiring day and lying in bed awake for hours, finally falling asleep sometime in the early morning, and waking up not at all rested! This is especially effective if you are bored with trying to get a lot of restorative sleep the night before an important day. This is most effective when you are the one giving birth and/or breastfeeding, but it works for the non-pregnant parent, too. The unborn child can begin keeping you up as early as halfway into the pregnancy, so depending on your style of nighttime parenting, you can be guaranteed to effortlessly go without a good night’s sleep for up to two years! Sometimes more! I thank you for reading these tips on getting a bad night’s sleep. This is by no means a comprehensive list—you may have noticed I left out some major contributors, such as caffeine and illegal drugs—but merely some of my favorites. 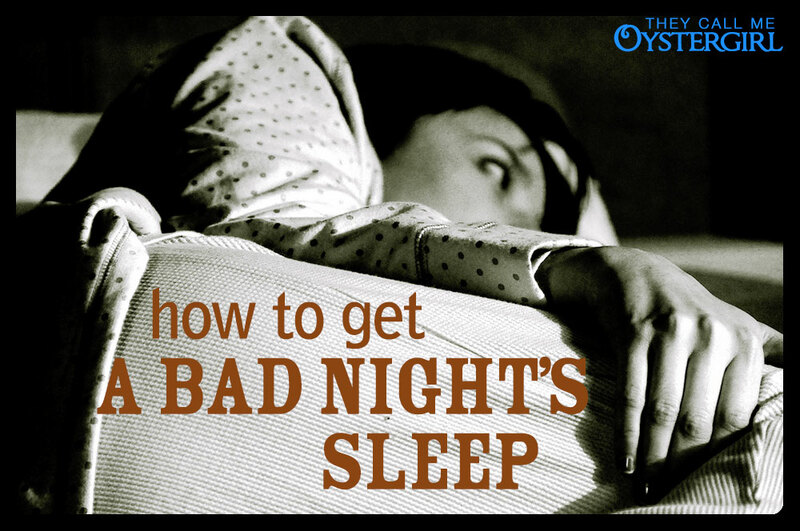 In the comments section below, I encourage you to share your favorite ways to get a bad night’s sleep!